4 elements Including an 11" Even-Heat Ultra element offer the power to meet your cooking needs. 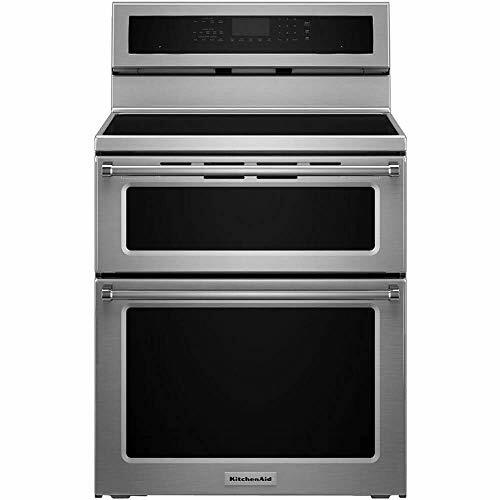 Circulates air throughout the oven Even-Heat convection uses a convection fan and the bow-tie design of the oven to ensure consistent heating (lower oven only). Self-cleaning mode Does the hard work of scrubbing for you. Accommodates multiple dishes simultaneously 4.2 cu. ft. lower oven and 2.5 cu. ft. upper oven provide plenty of room for dinner and dessert. Find room for your odd-shape cookware 3 oven racks (2 lower, 1 upper) and 7 rack positions (5 lower, 2 upper) help you optimize the space inside the oven. Add moisture to the oven without releasing heat Steam rack enhances your cooking for juicy results. Cook with confidence EasyConvect conversion system adjusts conventional oven times to convection oven times to prevent overcooking. Safely maintains a certain temperature for an extended period of time Sabbath mode enables easy compliance with kosher cooking practices. See quickly which elements are too hot to touch Hot-surface and power-on indicator lights help you and your family stay aware in the kitchen.